Social icons are easy to add with our themes. You only have to create a custom menu and add your social media profiles as menu links to it. Go to Appearance → Menus in your WordPress Backend and click on create a new menu. 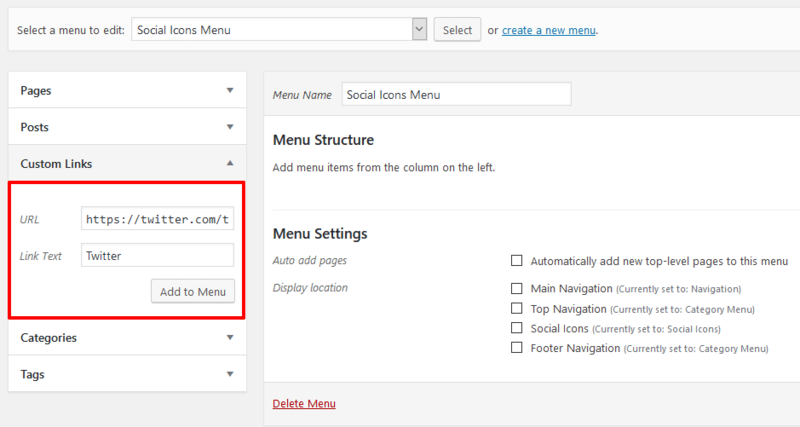 Then insert a menu name like Social Icons to create the menu. Afterwards you can add all your social media profiles by using the Custom Links menu type. Enter the URL to your social media profile like Twitter and Facebook. The Link Text is not displayed and only used in the Backend. You can add a new Custom Links menu item for every social media profile you want to include in the social icons. After you have added all your social media sites, don’t forget to save the menu. After you have created and saved your Social Menu, go to the Manage Locations tab. Then, assign the Social Menu to the Social Icons menu location. Depending on the theme, there might be different menu locations available for social menus. For example a location for Header Social Icons or Footer Social Icons. Please note that social icons are not displayed in normal locations like Main Navigation. In addition, you can also display the Social Icons Menu in a widget. The Social Icons Widget is part of our free Widget Bundle Plugin. After you have installed and activated the plugin, you can use the Social Icons Widget on Appearance → Widgets in your WordPress Backend. The theme will automatically detect the URLs of your menu links and show the appropriate icon using the Genericons icon font, supporting all social icons that are included. If you add a link to an unsupported website a default icon will be used.